A historical photo of That Dam in 1920, seen in one of Vientiane's restaurants. 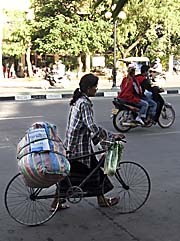 Streetlife in Vientiane. Some vehicles are used until they are down to the 'bones'. 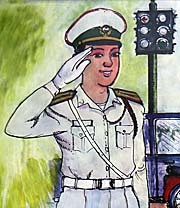 A police advertisement in Vientiane. The police is your friend and helps. At least so long as you are not poor, no 'drop-out' and you have the necessary stamps in your passport. In fact I wonder about the policemen's qualifications and are very happy that I never ned their assistance. Inside one of the new supermarkets in Vientiane. 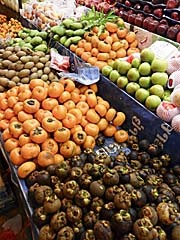 Kind of international standard, alone the local fruits make a difference. The street names are signed out in two languages, Laotian and French. 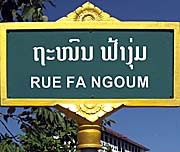 'Rue Fa Ngoum' (also: Fa Ngum) relates to the first king of Lan Xang, the medieval kingdom in the north of Laos. Fa Ngoum Road leads along the river banks. 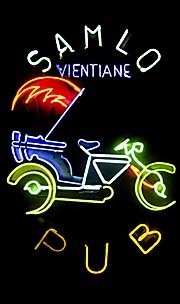 Nightlife is considered poor in Vientiane. There is a deadline at eleven or midnight for the bars and nightclubs to close. Two very different kinds of Buddhas were to find in Wat Si Saket. 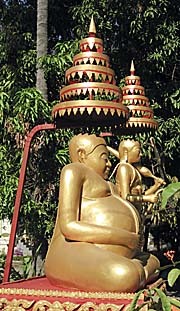 The 'fat' ones are supposed to be of a Chinese kind, the one above represents a typical Southeast Asian Buddha. 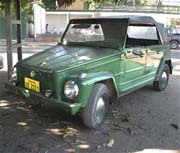 A VW Kübelwagen in a remarkably good shape. It's a German World War II military vehicle, the olive-green brother of the famous VW beetle. Maybe it was brought as war loot from Germany to Indochina by the French army, when they tried to reconquer eastern Indochina. Vientiane, Laos' capital, is a city at the banks of the Mekong River. It lies on a huge plain. The majestic Mekong marks here the border between Laos and Thailand. Both countries are linked by a monumental bridge over the river some 18km riverdownwards of Vientiane at Nong Khai/Thailand. It's the 'First Thai/Laos Friendship Bridge', built in 1994 with Australian aid. The inter- national known name 'Vientiane' roots in the colonial time; in Laotian the city is called 'Vieng Chan', or, officially 'Nakon Luang Vieng Chan', in difference to the prefecture and the province of the same name (Vientiane). 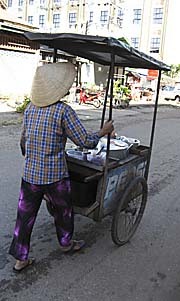 Just a few years ago Vientiane was maybe the most laid-back capital in the world. At least for a visitor from outside, who does not realize the tensions behind the scene. The whole infrastructure was run-down, old and simple. Little traffic run on the bad roads. Vientiane was (and still is) partially coined by French colonial architecture. It's population is roughly estimated 350,000 inhabitants in the city, in the wider catchment area it's roughly more than the double. 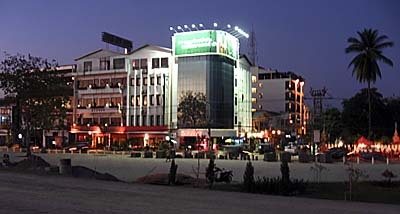 Vientiane is Laos commercial and economic center. Since the whole country, particularly the provincial cities, are undergoing a rapid process of economic development, there is much change happening in Vientiane as well. It seems to be a big building site, what is particularly apparent at the river banks, where a broad, soulless boulevard spreads now where before was simply a natural stripe of green embankment. The fertile Mekong River plains are attractive grounds for settlements. There are traces of prehistoric settlements at the place of the city. 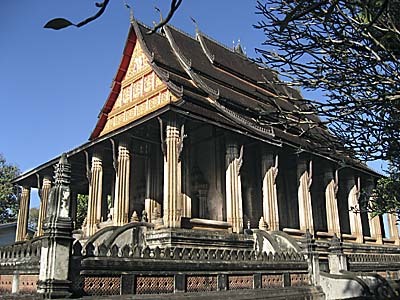 A foundation of the city of Vientiane dates back into the 13th century as a Khmer settlement. Later it was part then of the early Laotian kingdom of Lan Xang, which capital was Luang Prabang. Later again, due to military threats from Burmese kingdoms in the west, the capital of Lan Xang (the Land of a Million Elephants) was moved from Luang Prabang to Vientiane (1563 CE). From 1575 CE on Vientiane was occupied by Burmese troops for seven years. After that period it became a capitol again, parallel to Luang Prabang. Ho Pha Kaeo, a former temple, built in the years around 1560 CE. It was housing the famous emerald Buddha which was brought from Chiang Mai to here. After the Siamese conquest of Vientiane in 1779 CE the Buddha was brought to Wat Arun in Thonburi (Bangkok). Ho Pha Kaeo got destroyed in the next Siamese conquest of 1827 CE and was later rebuilt by the French. Now it's housing a museum and a shop. Lan Xang fell 1707 CE into three parts: Luang Prabang, Champasak and Vientiane were the three capitals of the three Laos ('Laos' is actually the plural of 'Lao'). After the downfall of Ayutthaya under Burmese siege (1767 CE) the kingdom of Vientiane was under threat of Burmese troops again and had to pay tribute to the kingdom of Ava. Soon after, when the Siamese king Taksin gathered the remaining Siamese forces and re-established Siam with a new capital at Thonburi (now part of Bangkok), Siamese territorial expansion went east and northeast. 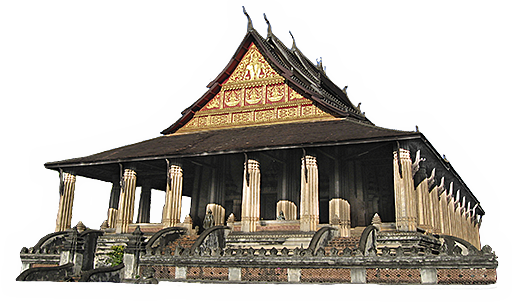 It covered also Vientiane, which became a Siamese vassal state in 1779 CE. A legendary Laotian insurgence in 1826/27 CE, led by king Anuvong (also: Chao Anou) of Vientiane, ended in a total disaster. After marching with his troops towards Bangkok, Anuvong was defeated around Khorat (Nakhon Ratchasima). Vientiane got destroyed by the Siamese and a great deal of the population east of the Mekong River was resettled in the territories who were safely in Siamese hands. It's estimated that a 100,000 people were subject to this resettlement. Thailands northeastern provinces in Isan are still demographically dominated by people with Laotian roots. The difference to the people of central Thailand is still apparent. 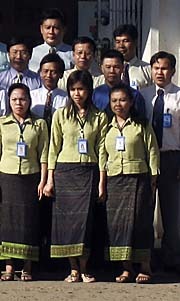 The descendents of the displaced people are still known in Thailand as the 'Lao Wieng'. King Anuvong himself was brought to Bangkok and either executed there or, according to other sources, could commit suicide to escape torture and further cruelties. In the mid-19th century colonial France set foot on Indochinese grounds first in Vietnam and claimed more and more territories it's own. In 1863 Cambodia became a French 'protectorate', a nice sounding, diplomatic term for a colony. In the coming years Laos followed step by step. Vientiane became part of 'French Indochina' in 1893. In 1899 Vientiane became the capital of the Laotian part of French Indochina. However, Laos was never of importance for the French and it didn't pay out the costs it caused. 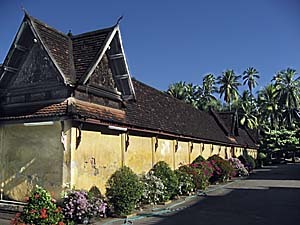 The French and the Laotians did some restoration of old buildings in Vientiane in the following decades, but Vientiane remained an unimportant place. In the Second World War the French lost control over Laos, but they couldn't accept it. French military forces tried to reconquer the lost Indochinese territories again from 1946 on, but they finally lost after they caused a lot of havoc and violent trouble in the world region. Laos became independent from 1953 on, a year before France got finally beaten militarily at Dien Bien Phu in Vietnam. 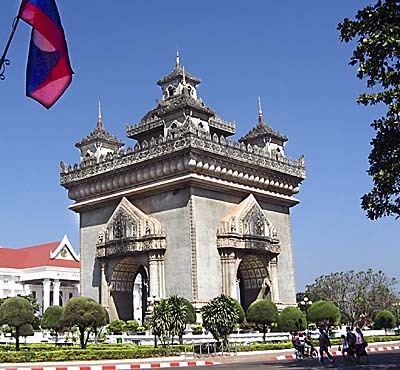 Vientiane became the capital of the newly founded Laotian state. 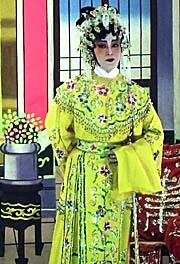 ...a century away from Saigon . . . an uninteresting town consisting of only two real streets, one European restaurant, a club, the usual grubby market . . . Where Vientiane has two streets Luang Phrabang has one, some shops, a tiny modest royal palace (the King is as poor as the state) and opposite the palace a steep hill crowned by a pagoda . . . One can see the whole town in a half an hour’s walk . . .
After the most brutal and desastrous American Indochina War (1964 - 1975; see also: 'Bombs on Laos') the communist Pathet Lao took Vientiane and the whole country over. Vientiane has an airport closely west to the city. It's much closer to the city center than the notorious northern bus station, twelve kilometers out of the city, a masterpiece of erecting artificial and very annoying obstacles for travellers for the sake of a few dull jobs as taxi and tuk-tuk drivers. The bus station for the busses to the south is as well far outside the city; there is a smaller one at Talat Sao in the city for closer destinations as Vang Vieng. Many tourists who travel in the touristic infrastructure and buy tickets at their guesthouse or hotel won't realize the nuisance of the misplaced bus stations; they get a pick-up service. The 'First Thai/Laos Friendship Bridge' 18km downstream of Vientiane is the major traffic link between the both countries. In 2009 the bridge was expanded by a railway track in the middle of the bridge. There is also a train station for the train which crosses the Mekong bridge at Nong Khai. It is the only piece of railway in whole Laos and only a few kilometers long. The name of the railway station is Thanaleng. There are plans of Chinese investors to expand the railway line through north Laos and, leading it via Boten to Kunming, Yunnan Province (China). This line would lead over 421km through north Laos, through 69 tunnels and over 165 bridges, equipped with 21 train stations. It would be part then of a larger train connection between Kunming and Singapore. The internet conncections in Vientiane were always miserable, but are steadily improving. Vientiane is home for the only Laotian university (National University of Laos, NUOL). For an image of the prominent 'First Thai/Laos Friendship Bridge' click the link. Although Vientiane is the economic and industrial center of the country, there are not many industries here. It's mostly agrarian products who are exported into neighbouring countries like wood, woodwork, textiles, tobacco, rice, sugarcane, vegetables etc. The most prominent factory in Laos is certainly the Beerlao brewery. There are additionally some wood factories, a cigarette factory, concrete production. Laos is destroying most of it's rivers ecology, namely the Mekong, by building a great number of hydroelectic dams on them. The electricity is meaned mostly for export, to get the annual trade deficit under control. 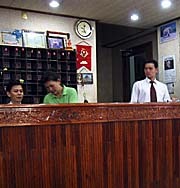 In 2011 there opened even a stock exchange in Vientiane. Apparently the party leaders try to learn from big brother China and combine the most negative sites of both: real-existing socialism as a brutal one-party dictatorship and neoliberalism as a brutal exploitation model for man and nature. 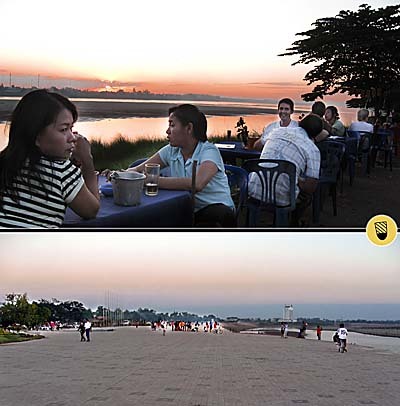 The change of the Mekong River promenade at Vientiane is total. The picture above shows the river banks at an evening in November 2006. It's still in a widely 'natural' state with grass and trees and simple outdoor foodstalls. Four years later, in November 2010, the whole kilometers long stretch was all paved and made-up prestigiously. 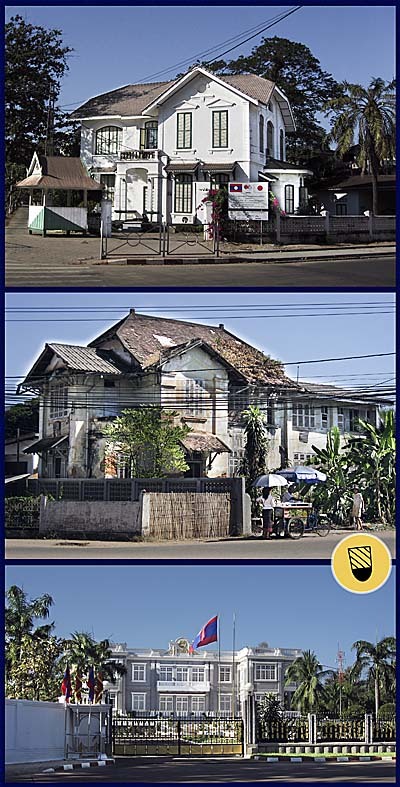 Who visited Vientiane in 2011/2012 could witness a massive building boom in the Laotian capital. Preparations for the international 9th Asia-Europe Meeting' in autumn 2012 kept the city busy as it was never before in it's history. Heavy trucks drove slowly, but non-stop along the Mekong banks. They transported gravel and sand, which was dredged out of the river, to a huge building site. There, behind a fence, almost exclusively Chinese was spoken. A branch of the China CAMS Engineering Company (CAMCE) built 50 villas and two conference buildings at the best parts of the river banks for the high-ranked international guests. Since little Laos didn't have the means to prepare independently for the meeting, neighbouring China helped out. In reverse for the Chinese investment CAMCE got 25 hectars of the Mekong island Don Chanh leased for the next 90 years. They will build another new living quarter there in an 140 million Euro investment. The 163 households of mostly poor families who already existed there had to move out. A much bigger project than that is the one of Wan Feng Shanghai, another Chinese company, who invests more than a billion Euro in a huge project at the eastern skirts of Vientiane. A new part of Vientiane comes into existence there. Fa Ngum road, the parallel road to the river in the evening. Road and boulevard are still under construction. In the background are the same modern, faceless buildings as we see them everywhere in the world nowadays. Additionally the international airport got a thorough upgrade. Space for more than 40 big planes got built by a Japanese investor. China granted a credit for a new airport terminal. Built by CAMCE as well. Also the presidential palace got expanded and modernized. The Krittapong Group was building a new eight-storey high five-star hotel with 196 rooms. On the other end, in expectation for the high-ranked international guests, the city should be cleaned from people who impair the brave new image: beggars, drug-addicts, prostitutes and so on. That's a typical piece of police work. Laos still run's some of the notorious 'reeducation camps'. It's, by the way, very remarkable that for such a meeting of international politicians such a pompous expenditure is done. The functionaries of the so called 'western democracies' are as far away from the worries and needs of the common people as the politicians of the Southeast Asian countries. In our post cold war world more and more people ask themselves what's actually the difference between the rotten and corrupt western political class and party system and that of an ordinary third world dictatorship. 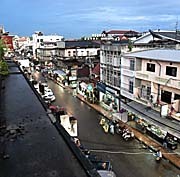 Vientiane's building boom is also a representative example for the rapid development of Southeast Asia generally. Strolling through the modernizing capital leads to the discovery of some smaller eyecandies. There is a number of old, colonial buildings in the city who look quite pretty. Some of them are (very nicely) restorated, others not yet. The image below shows the presidential palace of Vientiane. The construction begun still in the American Vietnam War (1973), but wasn't finished when the Phatet Lao took power over. Since 1986 it's officially the residence of the president of Laos, but not the official home of the president. The presidential palace is not open for the public, but a landmark in Vientiane, close to the river and in direct neighbourhood to Wat Si Saket. Images (2006) and photocomposition (2014) by Asienreisender. There is not much of interest to visit in Vientiane. The reason to come here is often rather the fact that Vientiane is a traffic hub and a destination when coming from northeast Thailand on the way to north Laos. Moreover every day hundreds of western expats who live in Thailand have to perform their notorious and troublesome 'visa run'. The Thai consulate in Vientiane is a miserable place with long waiting-times and a really bad, stubbornly and extremely buerocratic organisation. Applicants even have to go there twice for their visa, because a stamp in a passport takes more than 24 hours. Elsewise there are some, few more attractions mildly worth a visit. To absolve them is easily possible in a single day. 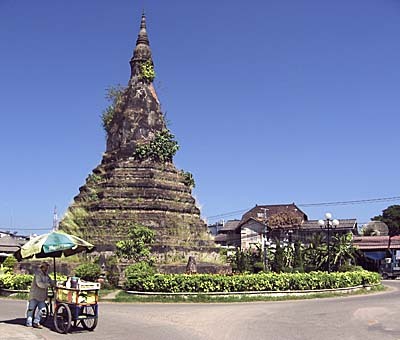 Pha That Luang is a 16th century old bombastic stupa and is counted as a national symbol for Laos. There are some legends about this sight. Allegedly the stupa contains a bone of the historical Buddha. Probably there was already a 13th century Khmer temple on the spot, marking the center of an earlier Khmer settlement. After the building became damaged twice it was restorated by the colonial authorities in the early 20th century. Another remarkable and bulky building is Patouxay (victory gate, also: Patou Xai, Patuxay, Patousay, Patouxai, Patousai, Patusay, Patu Xay, Patou Xai, Patou Xay), which reminds to the Arc de Trioumphe in Paris, although the iconographies are oriental. With a height of 49 meters it's dominating the broad, representative Xang road. The concrete monster was designed in the 1960s as an independence memorial. Later the communist government reinvented the building as a memorial for the communist takeover in power 1975. Patouxay, the bizarre independence monument of the kingdom of Laos, built after the French colonialists involuntarily left the country. It's remarkable to create such a memorial in a similar style of the central victory monument in Paris. A much nicer sight is Wat Si Saket, built in around 1818 in order of king Anouvong (who was later executed in Bangkok). 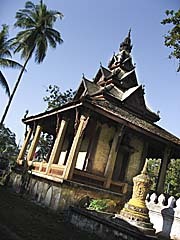 After Anouvong's war against Siam and the destruction of Vientiane, Wat Si Saket was spared by the Siamese. The reason might be that the temple's architecture is rather Siamese than Laotian. 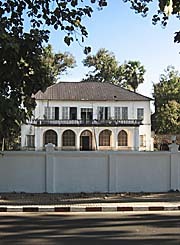 The French École française d’Extrême-Orient (French School of the Far-East) did a thorough restoration of the Wat in the 1930s. There is an attached museum in the charming old temple integrated. On the other roadside opposite Wat Si Saket is Ho Pha Kaeo placed, another temple which is used as a museum nowadays. Originally this temple was constructed in the years around 1560 CE to house the famous emerald Buddha (Phra Kaeo) who is now in the royal palace in Bangkok. The famous Buddha statue, nowadays an important sight in Wat Phra Kaew in Bangkok, was taken by Siamese conquerers in 1779. 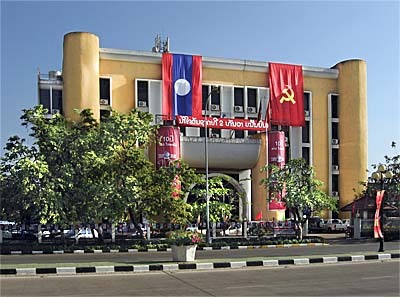 There is also a 'Lao National Museum' in town. One of many bizarre and huge concrete sculptures in Buddha Park between Vientiane and the Friendship Bridge. 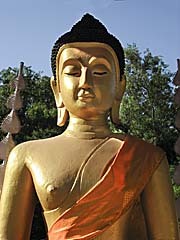 Another of these Buddha Parks is some three kilometers outside Nong Khai. No more inside Vientiane city but on the way to the Mekong bridge at Nong Khai is the bizarre 'Buddha Park'. 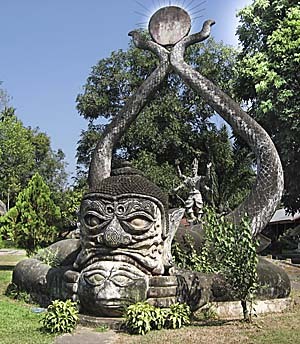 It was created 1958 by Luang Pu Bunleua Sulilat, the same artist who later built a similar Buddha Park a bit outside of Nong Khai. Some see it as a sacred Buddhist place for many of the gigantic statues there are of Buddhist kind or elsewise variations of temple figures. Others see it as 'Monster Park', for the overdimensioned concrete statues mostly look quite distorted and show scaring face expressions. On the way to the Buddha Park one passes also the very famous Beerlao brewery which is situated at the left roadside. So far I know it's possible to arrange a visitor date in the brewery. Imagine a day dedicated to one of the best beers of Southeast Asia, in existence since 1973. Beerlao might be the biggest Laotian company: in 2006 it was the biggest taxpayer in the country (drinking beer for socialism!). 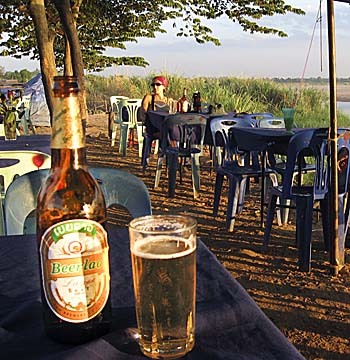 In 2008 another branch of the brewery was opened in Champasak (Pakse, south Laos) to satisfy the rising demand. Although the taste is fine, it's a bit sour, though, and can trouble the stomach. Anyway, as a beer-drinker one can not escape Beerlao in Laos: it has an omnipresent market share of more than 98%, due to high import taxes for foreign beers. Cheers! Nowadays the LBC (Lao Brewery Company) is owned by 49% by the Laotian state; 51% are mixed between Thai and Italian investors and Carlsberg brewery, who joined the business later.